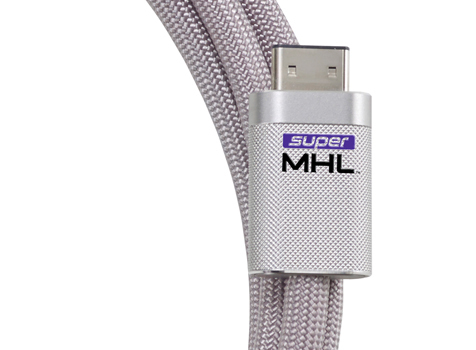 The MHL Consortium seems to have pulled out all the stops with the SuperMHL cable. Rob Tobias, president of the Consortium, believes that this brand new cable will bring to viewers the impeccable visual quality that has, until now, just been a dream for Hollywood studio biggies. According to him, the SuperMHL cable is capable of delivering an ‘amazing video experience’ and this makes it rather evident that the MHL Consortium is on the right track to take the lead in terms of technology compatible with future TVs. If MHL technology was first introduced to solve the problem of powering up devices while simultaneously getting digital video output from them, Super MHL is all geared up to become the game changer in this arena. Not only does the Super MHL cable look beyond the mobile intensive landscape, unlike its predecessors, it also brings home substantially enhanced features that put it in a class of its own. The cable enables 8k video at 120fps, which is no mean achievement by any standards, and the cable achieves this by doubling the bandwidth over a single lane. TV technology continuing to improve year on year and H.265 phones all ready to flood the market, the need for video interface that can handle data for these devices is clear and present and this is exactly the gap that the Super MHL fills in admirably. Tobias explains why the Consortium decided that the new cable should be branded as an entirely new age design rather than giving it the name MH4, in line with its MHL 1, 2, 3 series. The new features and new specs led to this reasoning, he says and there is enough justification for the impressive name, if you take a look at the equally impressive credentials that Super MHL brings to the table. The most significant upgrade that the Super MHL offers is its maximum resolution of 8K120 when compared to its predecessor MHL3’s 4K30 resolution. Of course, compare it with the very first of the line, MHL1’s 1080p60 resolution and you can how Super MHL has made giant steps forward in terms of visual quality capabilities. That is not all that this new cable stands out for. High dynamic range, deep color support up to 48 bit color depth is another feature that sets this cable truly apart from the earlier versions that the MHL Consortium has turned out. Dramatic improvements in audio are also a part of Super MHL’s brand new list of features. The cable supports immersive surround sound and offers complete support for object audio formats including the world class Dolby Atmos, 3D audio, DTS UHD apart from featuring an audio only mode. Super MHL’s reversible connector comes with 32 pins compactly designed into a Type A HDMI cable pin. The 32 pin format makes it possible for the Super MHL cable to deliver 6 lanes of data as well as do the power charging and video more effectively than the single lane that the older MHL’s can carry. The reversible design is the end users’ dream allowing them maximum flexibility in use, eliminating the need to determine the cable’ direction or plug orientation. Unlike the earlier versions, the MHL Consortium has also addressed another need that is spurred by the future 8K TVs all set to hit the market. The Super MHL cable is a single cable that can deliver the huge data plus deep color plus high frame rates that these TVs necessitate. With HDMI 2.0 falling short with its 4Kp60 video capabilities, the Super MHL is the ideal choice in its stead. Efficient power up is one of the core objectives that the MHL Consortium started out with and with the Super MHL, it appears that this objective has been fulfilled in the most efficient and impressive way indeed. If the older versions of the MHL cables can charge devices capably, the Super MHL takes several steps further providing 40 watts of power while charging. That means super fast charging for you while your device is plugged in, letting you watch what the videos that take your fancy without interruption.